DETROIT — The North American Free Trade Agreement "is going to blow up in 2018." 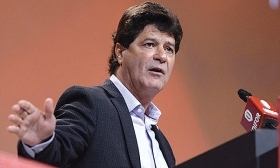 That blunt assessment comes from the equally blunt Jerry Dias, president of the Canadian union Unifor. Dias has long been a harsh critic of NAFTA. He says it has been disastrous for Canadian and U.S. manufacturing workers — on that much, he and President Donald Trump agree. And it hasn't done much for Mexican workers, whose low wages and weak labour rights prevent them from being able to afford the vehicles they build, he said. Dias, for his part, would prefer to see NAFTA not scrapped, but strengthened with better wage and labour standards for Mexicans that would make Canadian manufacturing a more competitive proposition and help stem the southward migration of jobs. Many private-sector interests still hold out hope that the Trump administration's hard-line positions are simply negotiating tactics that will lead to a compromise, or that Congress will block attempts to unwind a deal that has helped increase U.S. manufacturing exports by 258 per cent since its inception. But given where the talks stand now, Dias said, that won't happen. "I'm convinced that unless Donald Trump folds, which he won't, then NAFTA is gone," Dias said during a nearly 90-minute editorial board meeting with Automotive News. If that happens, Dias said, a pre-existing U.S.-Canada free-trade agreement will live on. Dias said that while he's not at the negotiating table, he has a close-up view of the proceedings. He is among a group of stakeholders consulting with Canadian officials on the pact and has had multiple meetings with Foreign Affairs Minister Chrystia Freeland, chief negotiator Steve Verheul and other Canadian officials, as well as U.S. Commerce Secretary Wilbur Ross. "I've been having unfettered access to those who make the decisions, but I've also had a complete green light, understood and sanctioned by the government, to say whatever the heck I feel like," Dias said. "It's not as if they're going to change my mind. But they understand that bringing in labor as part of the team is quite helpful." Unifor represents workers in 20 of Canada's largest industrial sectors, including telecommunications, health care and autos. That diversified membership gives the union a broad political base and more clout, Dias said, especially with Prime Minister Justin Trudeau's pro-labor Liberal Party. The reopening of NAFTA negotiations presented the union an opportunity to lay out its full agenda, including pushing for stricter enforcement of labor standards in Mexico. But between Trump's pledge to build a wall on the Mexican border and fresh disputes with Canada over softwood lumber and aerospace, he said, it has been clear there isn't enough good will to keep the talks on track toward a new agreement. "I am probably going to win more wine in 2018 than anyone in the history of wineries because I have bet every journalist in Canada, Mexico and the U.S. that NAFTA would not be re-signed by the end of 2017," Dias said. "I have to put in a wine cellar in my condo." The pending U.S. demands make that a much surer bet, Dias said, especially the Trump team's call for an 85 percent regional content requirement, with 50 percent U.S. content, on all vehicles imported into the U.S. It would leave Canada and Mexico fighting for a scrap of the remaining share, Dias said, and Canada's US$37-an-hour wages couldn't hope to compete with Mexico's US$2 rate. Canada will never agree to the U.S. content requirement, he said. He also pointed to the U.S. push for a five-year sunset clause as a sign of bad faith. "If we signed NAFTA in 2018 with a five-year sunset clause, who is going to make a major investment in 2020 knowing that it can blow up in three years?" "Nobody believes the United States wants an agreement," Dias recalled telling Ross in one meeting, adding: "Once Canada and Mexico got the indication that the United States wasn't serious about an agreement, it's all done." At this point, neither Canada nor Mexico would be motivated to offer even a face-saving outcome for Trump. "Nobody in Canada and Mexico wants to throw him a victory party," Dias said. "He's inherently unpopular. They think he's dangerous and foolish. For Trudeau, who's riding pretty high in the polls, to be perceived as folding to Trump is politically damaging." The sixth round of NAFTA talks is set to begin Jan. 23 in Montreal.